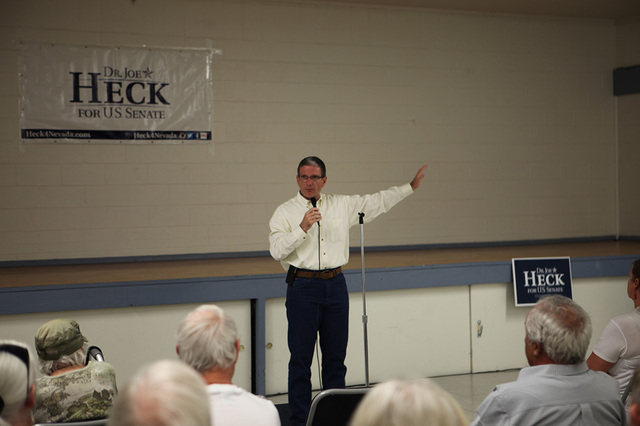 Nevada Congressman Dr. Joe Heck made a weekend campaign stop in Pahrump as he tries to mount support for his U.S. senatorial bid. Heck spoke to more than two dozen residents at the Bob Ruud Community Center on Saturday. The stop was one of a handful of rural communities Heck visited during the past several days. On Friday, Heck’s campaign traveled to Ely, Eureka and Yerington before arriving in Pahrump from Tonopah. He said Nevadans living in rural communities have unique concerns and challenges than those from larger cities and towns around the Silver State. Heck, who is seeking to take over the seat being left vacant with the retirement on Democrat Harry Reid, also spoke about the 2016 presidential campaign. Nevada’s unemployment rate fell to 5.8 percent in April 2016 under the current administration following the nation’s worst recession since the Great Depression under a two-term Republican administration. In December 2008, Nevada’s unemployment rate stood at 9.0 percent. Additionally, Heck is throwing his support to presidential candidate Donald Trump. Heck was elected to Congress following the 2010 mid-term election. According to his bio, Joe Heck was elected to the United States Congress on Nov. 2, 2010 as Nevada’s representative for the Third Congressional District, defeating incumbent Dina Titus. He serves on the Education and Workforce Committee and the Armed Services Committee where he is chairman of the Military Personnel Subcommittee. Heck is also a member of the House Permanent Committee on Intelligence and chairs the Subcommittee on Department of Defense Intelligence and Overhead Architecture. Heck touts more than 35 years in public service as a physician, Army reservist, and community volunteer. As a small business owner, he served as the president and medical director of Specialized Medical Operations, Inc., a corporation providing medical training, consulting and operational support to law enforcement, EMS and Military Special Operations. Heck also represented Nevada State Senate District 5 from 2004 through 2008, serving on the Natural Resources, Human Resources and Education, and the Commerce and Labor committees, and as vice-chair of the Transportation and Homeland Security Committee.